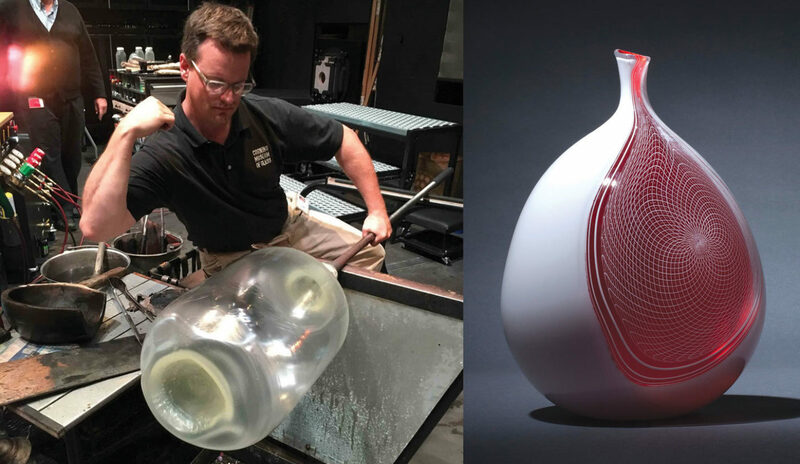 Glass artist Jeff Mack takes over the FIA’s Hot Shop for one week to create a new series of works. Museum visitors are encouraged to drop in throughout the week to see Mack and his team in action. Thursday, December 6 will be a slide lecture on his works and Saturday, December 8, a more formal demonstrations throughout the day. This residency is sponsored in part by the Art Alliance for Contemporary Glass. Jeff Mack is a glass artist and supervisor at the Corning Museum of Glass. He has worked in glass for 20 years as a master glass blower, factory stem maker, artist’s assistant, and gaffer for internationally recognized artists. Due to his keen interest in historic glassmaking techniques, he has devoted much of his study and work to this topic. His work is in galleries and collections worldwide and he has taught extensively. Awarded the Corning Award by Pilchuck Glass School in 2003, Mack demonstrated at Glass Art Society conferences in Adelaide, Australia, twice in Corning, NY, and Toledo, OH, as well as assisting Elio Quarisa in Amsterdam.